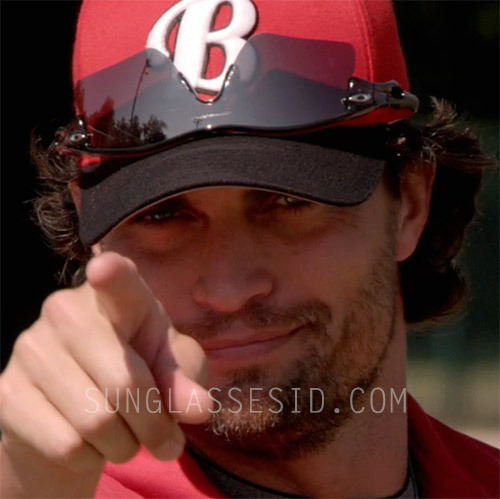 In the 2013 baseball movie Home Run, actor Scott Elrod wears a pair of Oakley Radar sunglasses in several scenes. The glasses worn by Elrod have Range glasses (the pointy shape glasses, as opposed to Oakley's Edge, Path or Pitch shape glasses), silver Oakley logo and a black frame. You can buy Radar sunglasses or even customize your own Radar sunglasses on Oakley.com. There is a special MLB collection of Oakley glasses, or you can add MLB etching of your favorite team. The Oakley Radar Range is also available on Amazon.com. Scott Elrod also wears a pair of Oliver Peoples sunglasses in the film.